Milwaukee Brewers outfielder Ryan Braun has won his appeal of a positive test for a performance-enhancing drug. The Major League Baseball Players Association announced the decision Thursday. Braun tested positive back in October for elevated testosterone, which was reported by ESPN in December. 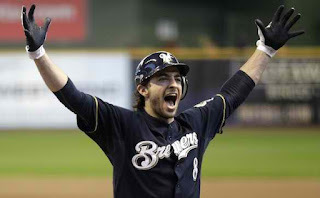 The Brewers organization and fans have backed the 2011 National League MVP, through the long silent process, which seemed like an eternity. Braun, who had faced a 50 game suspension, claimed throughout the process he was innocent. Brewers Manager Ron Roenicke said, "Ryan had exchanged texts with him and would report Friday to spring training," leading the media to report that a decision was close. Watch a video with Doug Melvins thoughts here. The Brewers Doug Melvin has worked hard to fill the void left by Prince Fielder’s signing with the Detroit Tigers, and the uncertainty of the possible Braun suspension, signing Arimas Ramirez to bat cleanup and Norichika Aoki to a two-year deal from Japan, for insurance in the outfield. The Great news today has the internet buzzing, and Brewers Fans hopes alive, and should help lift the Brewers to another record setting year! Go Brewers. Here are some reactions off Twitter about the Ryan Braun news. Green Bay Packers quarterback Aaron Rodgers tweeted in Braun's defense: "MLB and cable sports tried to sully the reputation of an innocent man. Picked the wrong guy to mess with. Truth will set u free #exonerated." Packers All-Pro linebacker Clay Matthews III tweeted, "Happy for my friend Ryan Braun. EXONERATED by the TRUTH!!" Brewers closer John Axford tweeted, "All I can say is that Braun has exemplary character is continuing to handle this in an unbelievable manner." 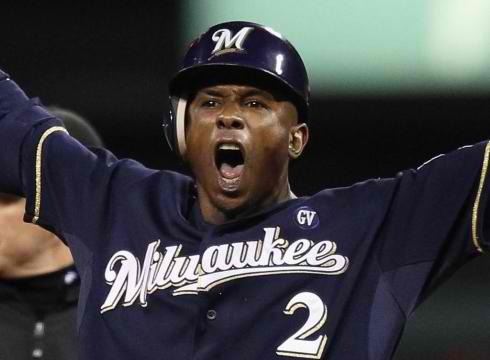 Brewers outfielder Nyjer Morgan posted on Twitter, "Aaaaaaaaaahhhhhhhhhhhhhhhhhh!!!! Great News for Brew Crew!!! The Hammer has been exonerated!!!"